Sheaffer Balance "Service Pen" fountain pen from the 1940s made of lower end materials to be used as a loaner pen. This pen was used by a bookstore. The pen is red with nickel plated trim. It is not reverse trim because reverse trim refers to pens that have trim different from what they generally had. This pen type primarily had nickel plated trim. A fine Sheaffer #3 nib is installed. The pen is in excellent restored condition. Product Name Sheaffer Service Pen based off of the Sheaffer Balance Junior, despite having a #3 nib and not a Junior nib, because of its cheaper trim we believe it is a Junior and not a Miss Universe. Manufacturer and Year Sheaffer USA -- 1940s, the flattened ball style clip was introduced in 1934 and used on non-Lifetime pens well into the 1940s. Filling System Lever filler - working perfectly with a new sac. Color Solid red color. 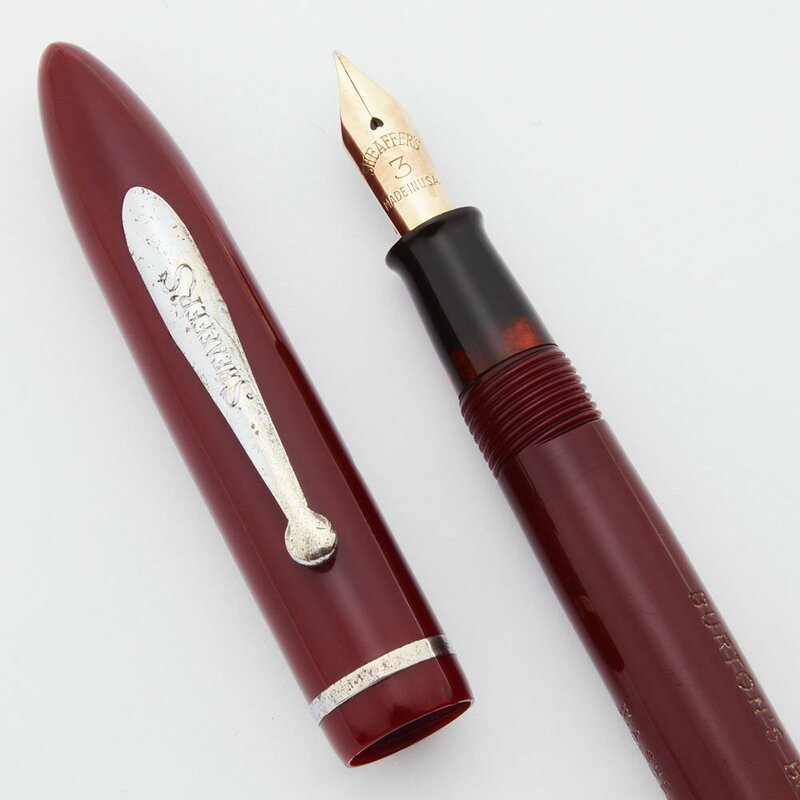 It's a dark red, but not burgundy, and was used on lower end Sheaffer pens. The trim is nickel plated but not "reverse" trim because it was not an expensive enough pen for gold filled trim. Nib FINE #3 14k Sheaffer nib. It writes smoothly and is springy. Condition Excellent condition. 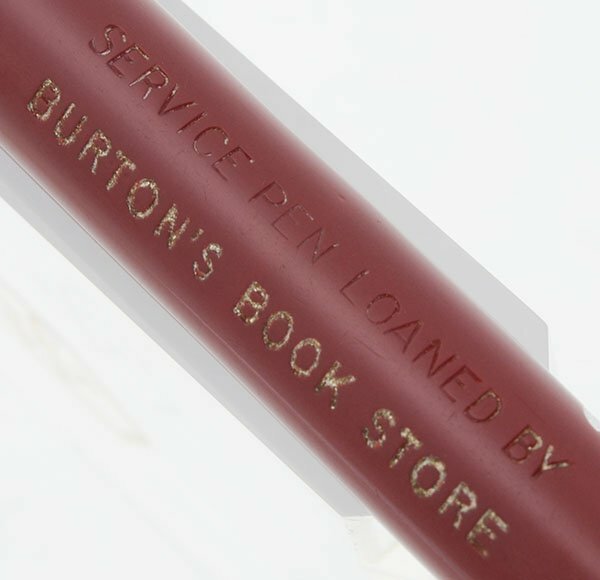 The barrel imprint, "Service Pen Loaned by Burton's Book Store" is clear. You can differentiate between the original imprint and the personalization specifying the store. The red is clear with no scratches and the trim has some plating wear but not that much for the type. The viewing window is very clear. The pen is fully restored and working well.